The owners traded an extra closet for this airy master bath. Photo by Stacy Zarin Goldberg. A master bedroom suite with too many closets? An odd problem to have, for sure, but one that enabled the renovation of a cramped master bath in the ’70s-era house Sarah and Daniel Blynn purchased in McLean’s Langley Farms neighborhood in 2016. Designer Elena Eskandari of Falls Church-based Case Design/Remodeling annexed one of three large closets to expand the tiny bath, giving it a makeover in the process. With its faux stucco walls and orange marble tile, “It felt like we were in a New Jersey Turnpike hotel in the 1980s,” Sarah says, noting that the previous owners had upgraded nearly every other part of the house, save for this one. The Blynns wanted the new bath completed before they moved in, which put the project on an accelerated track. 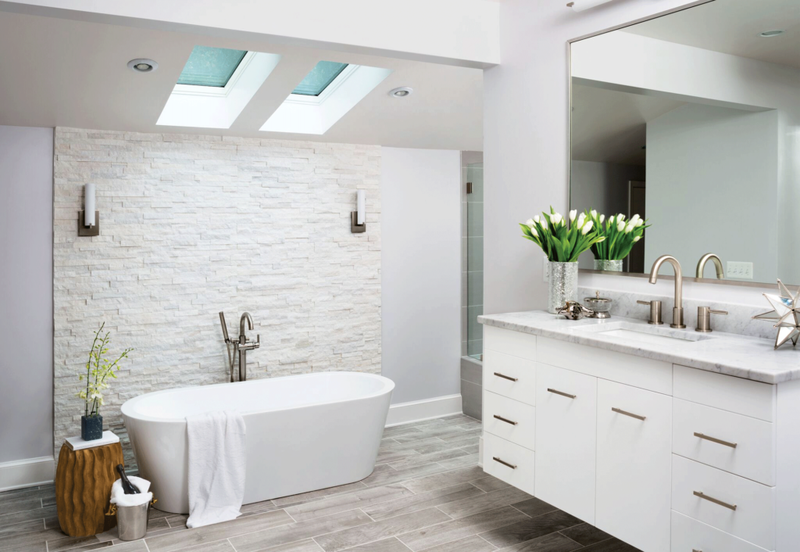 “One of the most important parts of the design was the space planning,” Eskandari explains, “because three skylights were existing.” The contemporary redesign positions a large, new shower under one of those skylights and a freestanding tub beneath the other two.